was founded in 1993 by Will Turner to provide BMW enthusiasts with Ultra High Performance BMW Accessories at reasonable prices. Turner Motorsport is a tuning company dedicated to developing, manufacturing, and retailing the finest products for your BMW and MINI. Beware! There are now hundreds of "performance tuners" on the web. Many of which sell products they are not authorized to sell. Turner Motorsport is different. We have a fully-dedicated building in Amesbury, Massachusetts where our sales team, marketing, and racing team operate. We ship to customers all over the globe from warehouses on the East Coast, Middle America, and the West Coast. Turner Motorsport is the exclusive importer and distributor of Supersprint Performance Exhausts in North America. We buy factory direct from leading companies like: H&R, Bilstein, Sachs, Borla, aFe, Corsa, Schrick, Red Line, Hella, Wiseco, Racing Dynamics, and Bosch, just to mention a few. Plus we research and develop many of our own performance and racing parts in-house. 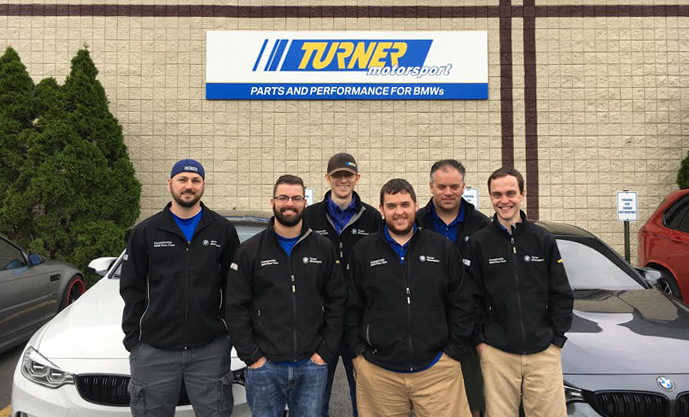 When you buy from Turner Motorsport, not only will you get a great product, you will also get a factory authorized product warranty and technical support from the Turner customer service team who have years of real world, hands-on experience. Turner Motorsport is dedicated in providing you with the best quality performance parts and accessories for your high performance BMW. We do not sell any performance accessory that we believe does not significantly enhance the performance of your BMW. In addition to performance upgrades, Turner also sells factory OEM replacement parts, many at a lower price than your local BMW dealership. Turner Motorsport Racing competes professionally in the IMSA United SportsCar Championship. Most recently winning the 2014 Tudor United SportsCar Championship GTD Team and Driver Titles. We test many of our performance parts on the race track before they are sold to our customers. Turner is also very active with Sports Car Club of America (SCCA) and BMW CCA Club Racing, and provide racing components and knowledge to teams running BMWs in Continental Sports Car Challenge, SCCA Club Racing, SCCA Pro Racing, and BMW CCA Club Racing, in addition to many international racing customers. We have a 6,500 square foot, fully-equipped installation and R&D / fabrication facility. Our experienced and factory-trained technicians specialize in BMW high performance street car upgrades, as well as factory scheduled maintenance, ensuring your BMW is in peak operating condition. Turner Motorsport is located at 16 South Hunt Road in Amesbury, Massachusetts. We are open Monday through Thursday from 8:00 AM to 7:00 PM and Friday from 8:00 AM to 6:00 PM. PLEASE NOTE: In February, 2016 our parts warehouse upgraded to a larger fulfillment center in Ohio. Consequently, our operation will discontinue parts pick-up in Amesbury, effective February, 2016. Turner Service will continue to thrive from our Amesbury location.